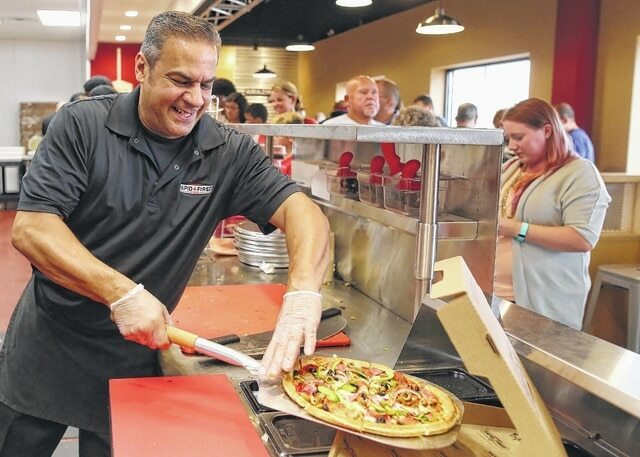 Corporate Trainer Johnny Rivera slices free pizza for the grand opening of Rapid Fired Pizza on Aug. 15. 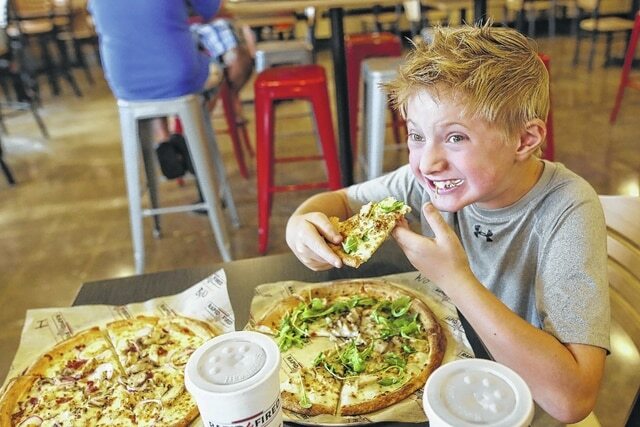 Eight-year-old Connor Wright tries his first bite of the new pizza during the grand opening of Rapid Fired Pizza on Aug. 15. LIMA — If you’re looking to grab a slice of pizza in Lima, you don’t have to look very far. No matter where you are in the city, it’s likely there’s one or more pizza joints within a mile or two. Elida Road alone boasts 10, when you include places such as Chuck E. Cheese’s and Pat’s Donuts & Kreme. In all, there are more than 30 separate locations that sell pizza in Lima. When you account for restaurants with multiple locations, the number jumps to more than 40. And there’s at least one more on the way. Mellow Mushroom Pizza Bakers is set to open Oct. 17 at 2530 Eastown Road. It’s less than a mile away from the nearest pizza shop, but franchisee Norman Moser isn’t worried. He feels Mellow Mushroom is far enough away from other pizza restaurants, and that it is unique enough to stand out from the crowd. Moser said the Mellow Mushroom he’s franchising is designed around the iconic rock band The Beatles. The restaurant will even feature an 18-foot tall yellow submarine that patrons can dine in. Moser added that he aims to create a “total dining experience,” with televisions, 36 beers on tap, a patio area and a uniquely designed interior. When it opens, Mellow Mushroom will join Lima staples such as Fat Jack’s Pizza, which has three locations in the city. Fat Jack’s has been open for more than 40 years, and was voted “Best Place for Pizza” by readers of The Lima News in 2016. Owner Dave Boyles said they’ve won the award every year but one since the survey was created almost 20 years ago. In his four decades owning Fat Jack’s, Boyles has seen dozens of pizza restaurants come and go. He said Lima has become “inundated with pizza places,” though some don’t last long. While he said any new restaurant that opens in town could affect his business, one of his competitors doesn’t seem to be taking a bite into his sales. Marco’s Pizza opened earlier this year, and is located less than a mile from the Fat Jack’s on Spencerville Road. Marco’s franchisee Terry Burkholder did not return phone calls requesting comment. Another recent addition to Lima’s pizza market is Rapid Fired Pizza, which opened Aug. 15 on Elida Road. Franchisee Ross Wiley said they sold 960 pizzas on their first day, though that was largely because the restaurant was offering a free pizza promotion. Wiley acknowledged the fervor for Rapid Fired Pizza will likely cool down as time goes on, but he said he believes the restaurant will thrive for years to come. He cites the atmosphere, quickness, and variety Rapid Fired offers as reasons why the restaurant will stand out from the rest. One of Wiley’s recent customers, Lima resident Amber Steele, said she and her family eat pizza at least once a week. She said they tend to stick to local chains such as Padrone’s and Rapid Fired, and will even make the trip across town to Wally’s Fillin’ Station, a gas station that also sells pizza. Though she wasn’t exactly sure how Lima could sustain so many pizza places, she said it might have something to do with the fact that there are three colleges and universities in town. “I think the college students help quite a bit,” Steele said. Derek Schrock, a Defiance resident who spent his lunch break at Rapid Fired, said he has no idea how new pizza restaurants keep popping up. “You would think that, long term, all of them wouldn’t be able to keep their business,” Shrock said. Cory Good, a Waynesfield resident who makes the trip to Fat Jack’s around five times a month, was a little more optimistic. “It’s a big town, and everybody likes pizza, so [Lima] could probably hold a lot more,” Good said. While it’s unclear how many pizza restaurants Lima can realistically sustain, Moser does not think the market is oversaturated. He said he believes the fact that so many pizza places want to establish a presence in Lima is a positive thing.